As I sit here planning the summer schedule, I can’t help but think how much things have changed in the last 30 years. Yes, I’ve been doing this that long! Some days it seems like just yesterday and other days, it seems like 30 long years. Thanks to you, our wonderful customers, we have way more good memories than bad! 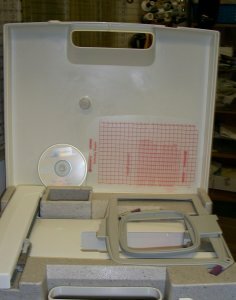 I remember buying my first computer to use for work. It was huge, DOS based, and truly a horrible experience. Now, we have I-Pads and laptops that can be used almost anywhere you go! 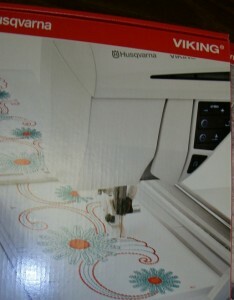 Our first embroidery machine was truly unbelievable. We just threaded it, and watched it make these beautiful 4”x4” designs. Now, we have touch LCD screens, memory sticks, automatic scissors and embroidery hoops so big that I can pass one over my body! Cell phones and E-mail were non-existent, and no one shopped on line—there was no Amazon! And NO stores were open on Sunday. Now you can shop on your laptop, 24/7, in your jammies! Credit cards were just starting to be used, but people actually carried cash (the green stuff-remember) or wrote checks back then. We all love all of our new gadgets, and plastic has all but replaced cash and checks. As a retail merchant, I understand the urge to shop on line for a bargain and maybe save some gas. But you can’t feel the fabric on line, or get the actual color in a photo, or stack up the bolts you like and take a “real” look at them. At the Stitching Nook we are always here to show you the newest gadgets, help you pick out the perfect fabrics, and share our newest projects. Plus, we are always here to answer your question, if a problem arises! I’m sure you all know that cotton prices have risen in the last year. Unfortunately, so have our electric, gas, water, phone bills, plus the fees we pay your carrier, to process credit cards. Please know, that we will never refuse your card, but we are asking that when your bill is less than $15.00 that you use cash or a check. That is one way we can reduce our clearance charges, and in turn, keep our prices lower. That makes it a winning situation for both of us. March is national Quilting Month. and see the specials available for this month! Looking for a new machine? Several special offers. Very low hours on both! Serviced, updated and ready to go! Includes FREE new owner’s classes. Price has been lowered and both include your choice of an endless hoop or 3 Viking embroidery design packs. 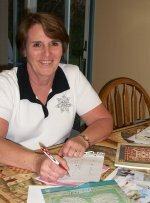 Linda has years of experience in both sewing and machine embroidery. Her love of sewing insures that her SVP events are fun and exciting and inspire attendees with confidence. She is committed to using her skill and experience to help participants understand that everyone has the ability to achieve exciting results with the technology available in today’s sewing/embroidery machines. Fee is $30 per person and includes lunch. Registration is a MUST! This is a limited edition model. 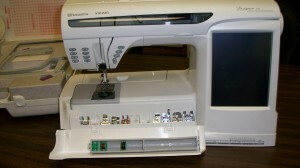 Stop in and see all the wonderful stitches on this machine, 10″ open arm for ease of quilting or general sewing. Plus, also receive this attractive tote filled with wonderful, everyday needed notions! Anytime during the month of your birthday, show us your driver’s license, and we will offer you a one time discount of 20% OFF all general purchases. “Thank You” for shopping with us!